For a limited time, you can save $10 on tickets to the World Space Expo! These tickets give you access to all of the regular activities at the Kennedy Space Center Visitors Complex plus exclusive access to the additional exhibits, events, and theThunderbirds airshow on Saturday and Sunday afternoon. Purchase your tickets now to get this special price! Congratulations to our sponsor the World Space Expo at the Kennedy Space Center! 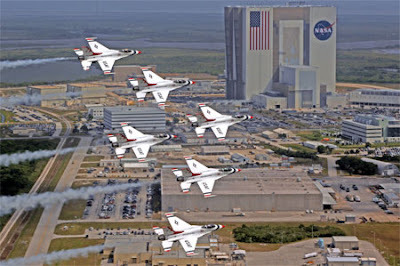 The USAF Thunderbirds flew over the Vehicle Assembly Building (“VAB”) on Monday. Hundreds of workers at KSC came out to watch the planes do a series of passes over the main industrial area where the Space Shuttle is maintained and prepared for launches. This flyover comes almost exactly 6 months before the start of the World Space Expo and the highlight show, an Aerial Salute to NASA with the Thunderbirds as the headlining act. The latest episode of the Space Task Force is now available for your listening pleasure. Just click here to download. We were honored to have Paul Sierpinski from the United Space Alliance in the studio. He’s an expert on the Space Shuttle’s External Fuel Tank. In the show, we talk about ZeroG (G Force One gets an upgrade). Tim gives us a recap of Yuri’s Night – from Washington, DC to California. Pictures from Yuri’s Night. The story of Moon Trees. We also discuss the new Space Shuttle schedule. [link] In-studio guest Paul Sierpinski talks about the Shuttle’s External Tank and what’s involved in making it flight worthy. We also give a special shout out to the National Space Society and the International Space Development Conference coming up this May. Enjoy the show… please let us know your feedback. Click the play button above for a special April 11, 2007 SpaceTaskForce Update.